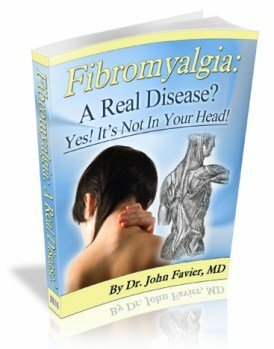 Fibromyalgia Disease: Is It Real? 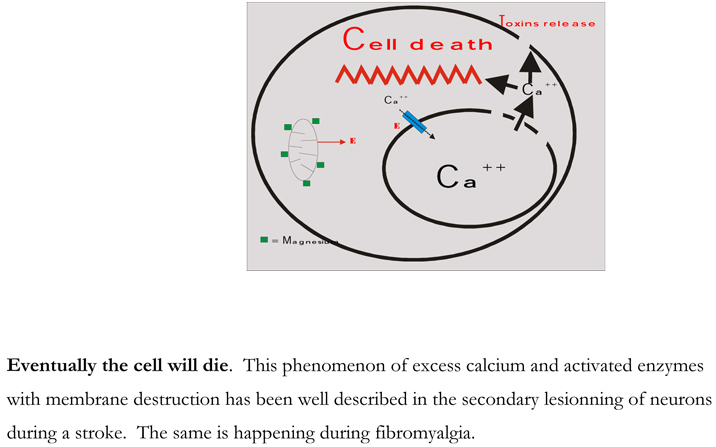 This first fibromyalgia book of a series of three fibromyalgia books will show you with 33 graphics how your muscle cells are affected, how they give you pain and how they produce toxins. Those toxins intoxicate you and give you more symptoms but that'll be in the second book of the three fibromyalgia books. 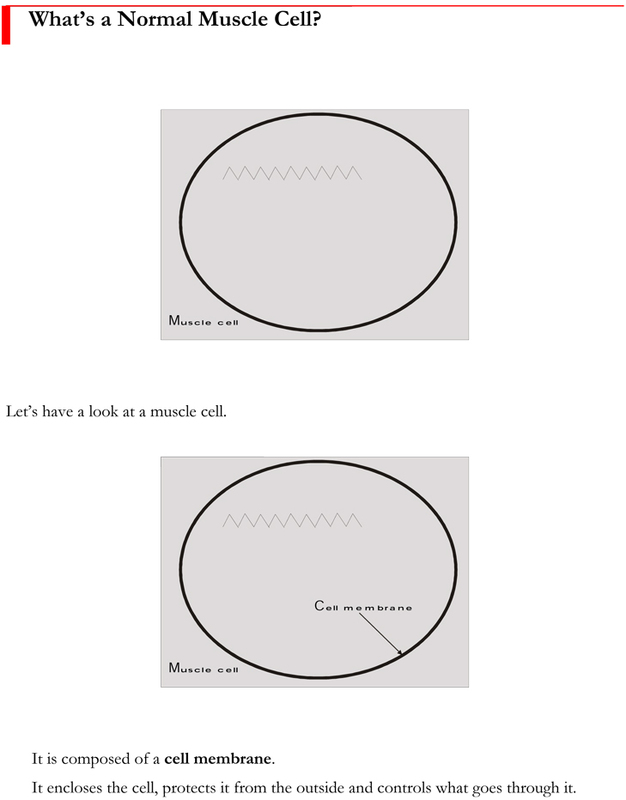 33 easy to understand graphics with a short text for each will take you through the whole process. Do you really need this? You want to be active and get better. That's your first step. Once you understand fully your disease you'll start feeling better because you're empowered with knowledge. To become a good and safe driver you didn't jump into a car and drove away! You had to learn step by step and in the correct order. You didn't start on a steep uphill road! 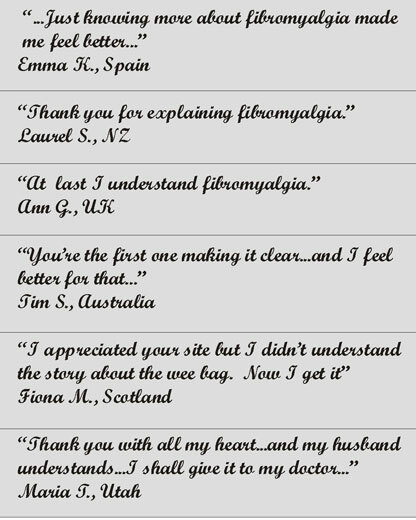 See the emails I've received from people who bought this first fibromyagia book. Even better, you can contact us and ask questions if you don’t understand something or you get worried or you want more. Why is that? Because your questions are the most important for you ....and me! My patients have taught me a lot. If I had not listened to them, I would not have been able to progress in my understanding, diagnosis and treatment. This is the result of hours of work with patients to put it as simply but also as fully as possible. Doctors and Nurses complain that patients don’t follow their treatment? If patients don’t know why they need the treatment, they'll be poorly compliant! You need to understand and that takes time. 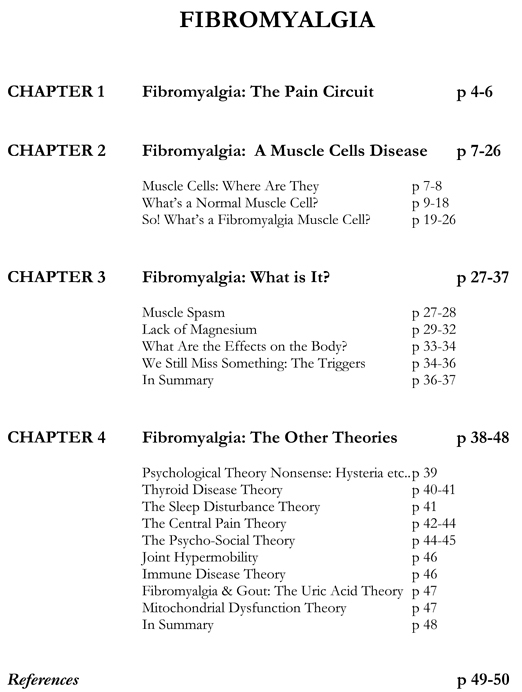 Yes, Fibromyalgia is a real disease and this fibromyalgia book will help you understand it. As a sufferer you’ll feel better once you understand it! For only US$ 13.60 you'll grasp the reasons of your disease. You pay through a secure billing provider and once your payment (credit cards and paypal) has been accepted, you'll be able to download it straight away in PDF format. If you don't have Acrobat Reader, you get a free link to download it. Why PDF? No virus! And we are so sure of the value of this book that if you are not satisfied you can get your money back within 60 days after your buy. No reason asked (but we would like to know why..). And you'll keep the book! And we have a special offer if you buy all three books! "Fibromyalgia Test: Diagnosis Of A Crippling Disease"